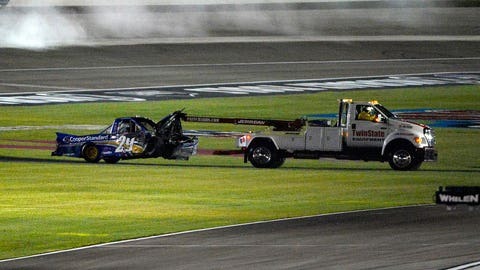 Brad Keselowski Racing’s Austin Theriault suffered a 10 percent compression fracture of the lower back during Saturday night’s NASCAR Camping World Truck Series race at Las Vegas Motor Speedway, the team announced Sunday morning. Theriault was injured in an incident with BKR teammate Tyler Reddick. After the two trucks made contact exiting the fourth corner, Theriault’s truck shot hard into the outside wall head on. A SAFER barrier did not protect the section of wall Theriault hit. The 21-year-old driver climbed from the car with the help of safety workers and immediately went to the ground beside the truck. He was placed on a backboard and taken to the infield care center. After evaluation at the track, he was airlifted to a local hospital where he underwent a comprehensive CT scan of the upper body. Theriault was released from the hospital and will follow up with an orthopedic specialist in North Carolina for further treatment. Reddick was able to recover from the incident to finish seventh. I want to thank everyone for their thoughts and prayers. Goodnight- I will update everyone in the morning.